The Gators beat Tennessee in a decisive stomping this weekend!! Hello? Anybody paying attention? Oh what’s that? You saw on CNN, MSNBC, the CBS Evening News and more that UF is famous for something besides being the champions of the world? Jokes aside, by now you’ve heard about that UF student who was Tasered by University Police Department at the John Kerry speech. Kid stands up to question John Kerry at ACCENT forum. First things first – how come nothing like that happened at any of the lousy ACCENT speeches I went to? HUH?! The only crazy thing I ever saw was Gene Simmons from KISS sticking his remarkable yet loathsome tongue down some married woman’s throat. I would certainly have traded that lasting memory to experience TaserFest 2007. 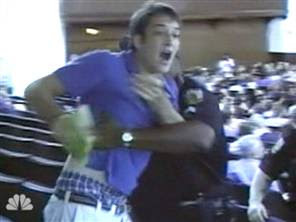 – it occurred to me like a Taser to the neck: I can’t decide which group to join until I know whose side this kid is on. On one hand, I’m happy join group C/D if this kid is a terrorist-sympathizing freak, or just some unruly bugger who disagrees with my views on life. Then I can find a way to justify the gentle electrocution he felt. On the other hand, he may hold the same beliefs as me, and in that case, I must hop the first flight to Gainesville Podunk Airport so I may join in the Gators Against Police Brutality Brigade. I know that sheds a huge spotlight on my own personal biases and prejudices. So Tase me. Whatev. Now that I’ve given it some real and fair thought, here are my two-cents. This Andrew Meyer character is five cans short of a six-pack. My research has found that he often videotapes pranks and purposely tries to disrupt campus activities. It seems he fancies himself like one of those “Jackass” fellows. Despite his wont for acting like a bozo, I propose that his loud, unruly shenanigans didn’t warrant Tasering, though I think he was probably getting exactly what was coming to him. Life has a way of doing that. At any rate, Andrew Meyer is probably enjoying his time in the national spotlight, and more power to him. Let’s all join hands and pray that when I get my 15 minutes, it doesn’t involve Tasers, John Kerry or Gene Simmons. he was resisting arrest...he totally deserved it! And Im not just saying that because I come from a family of cops!